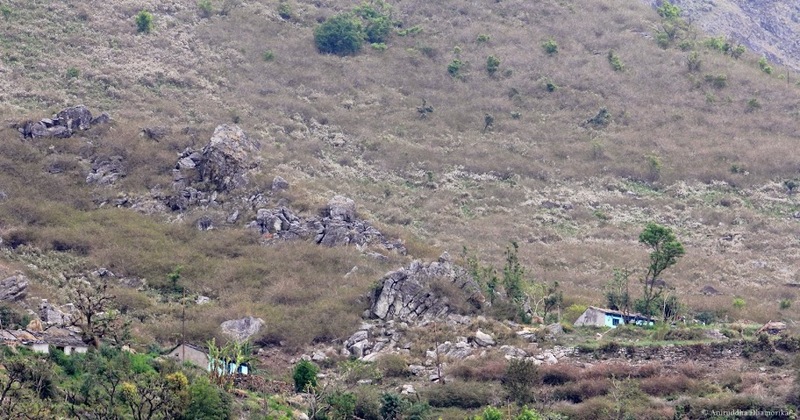 The road wound around shoulders of a number of mountains, past terraced fields ripe with wheat, and dived into valleys where bridges could not be built, and from this mountaintop to that it went, offering vistas of the Shivalik – the outer mountain range of the Himalaya –, where scars of landslides are seen everywhere, and only a handful shrubs take hold of the crumbling crowns of these ancient monuments. We stopped on the arm of a mountain that protruded into a gentle slope, at the last village on the mountain, for a meeting and a little ceremony of distributing solar lanterns to the residents of Amotha, 1290m from the mean sea level. Standing atop the edge of this Shivalik, I took a deep breath and inadvertently closed my eyes. The sun shone gently to my east, and a distant rumble of clouds rolled over beyond the mountain, coming from the way of the snow-clad Himalaya that lay further north. Earlier I espied a Purple Sapphire basking on a little herb on a small landslide south of the village, a Dark Clouded Yellow gliding gently over a bunch of asters, and a Blue Rock Thrush, Pied Bushchat, and a Himalayan Bulbul, all singing from their respective perches alongside a narrow path on the edge of the mountain slope – perhaps of the coming storm, or of the golden light that changes hues as one approaches, or simply to find a mate to spend the storm in shelter with. And then I felt something that one feels only when you’re unbound – that you’re in the right place at the right time – here is where you were meant to be, and there you were, soaking in the moment with that realization. And then I saw in a blue tinge as I opened my eyes – the vast forest stretching southwards for as far and I could see – for eons, if one were to walk through it. Only a day ago, I was in the most polluted city of India trying to find a place to sit before I boarded the train. The traffic across the street roared from sunrise to sundown. This city lies several hundred miles south of where I stood on that mountain, and the thought of chocking on pollution crept over my mind like the storm – dark and menacing – as I stood on the edge. A foreboding realization loomed over my unbound thoughts, cascading over the beautiful imagery that my senses helped built, that this forest that stretches for eons in front of you is actually an illusion – that it is fenced – that this feeling is nothing but forewarning of the end. We crept back to where we came from as the sky darkened, and went down the valley looking at the pale-purple Kachnar flowers, and trees laden with innumerable orchids, ferns, and a shy pair of Himalayan Goral (Naemorhedus goral), a wild mountain goat. The Dabka River emerges from these high passes, and flows through the mysterious forests of Sitavani that is full of myths and legends. From the mountains the river is seen cloaked in a pale green glow emanating from the handsome Sal trees in bloom. They resemble little flecks of pale snow, only that they are scented in the subtlest of fragrance no man can describe. The Shivalik foothills are clad in Sal trees, and here you can see the tallest order of them stretching as far as you can see. It is only at the edge of wheatfields that you see them finished. Along the shore of the rivers, they seem to stop, and bow in a gentle curve that appears to be protecting and praying to the river. In afterthought, they hug the river but do exactly the opposite with human settlements – they loom if they are not standing straight, and appear distant and tortured if not angry. The Dabka River is a small river by local geographical standards, but its vast shore of pale-pink stone, and its shroud of pale-green forests harbours a world as the world should be – with Great Indian Hornbills gliding in its canopies, elephant parades crossing over from the mountain pass, and leopards and tigers calling this Sita’s forest their abode. If I say that this world is a world as it should be, it is only here, surrounded by monocultures of rice and wheat, that it exists. And for most it is considered an unforgiving place to live in. The life in the mountains is full of struggle, many maintain. And most who say this have seldom climbed a mountain. Life here is tough, and in this toughness is born the will to live. The people of the Himalaya are as much a part of the landscape as the trees and the tiger. Lt. Col. Edward James Corbett, whose Gurney House in Kaladhungi now remains open as a museum, recognized this in his hunting sojourns, but he remains celebrated more for hunting of maneaters and killing of guiltless tigers. The link between the people and the forest is recognised in Corbett’s My India he wrote after bidding farewell to India – in its very title – a book he dedicated to the “simple, honest, brave, loyal, hard-working souls whose daily prayer to God [...]”, and “[…] people, who are admittedly poor, and who are often described as ‘India’s starving millions’, among whom I have lived and whom I love […]”. In the deep forests on the outer fringe of Corbett Tiger Reserve, we met Fatima and her sister waiting for the bus – a floral-designed bandana covered their head, and they shone out like flowers in their pink-and-blue salwar-kameez. We were travelling from the Sonanadi Wildlife Sanctuary when Kuber suggested a stopover for a glass of milk on the way to Rathuadhab in the northern corner of the reserve. Fatima and her sister soon vanished up a steep slope as we approached and a giant mastiff buff in colour and built barked relentlessly as if we committed the gravest sin of visiting. He soon received a slap on his back from Fatima’s sister, and was tied behind the house made of mud and wood. The house is situated on a small protrusion on the mountain. A pathway carved by elephants runs barely a few yards from the house. A corrugated, half-burnt and lifeless solar lantern hangs on the outside of the window which offers the most spectacular sight of the Mandal River valley, a river under the shadow of the Garhwal Himalaya. Fatima’s khatta is called Malai Khan, and she is Van Gujjar, the child of the mountain whose feet are as nimble on the mountains as that of the mountain goat’s, and her eyes as bright as the morning sun. Her grandmother offered us a glass of milk thick in cream, and we were soon on our way back just so that the mastiff would calm down. Van Gujjar are one of the earliest settlers of these forests – earliest because no other communities live a semi-nomadic life in this landscape anymore – and also the most latest – latest because they chose to live a life in here, surrounded by trees and elephants, and leopards and tiger that often visit their homes. They ride horses, and trade milk and milk-products, and maintain cattle numbering in hundreds. Anthropologists, wildlife biologists, and several other knowledge seekers will tell you tales of these people, but hardly anyone would tell you that they chose forests over concrete. In Fatima’s mind, this is the playground, the school, the life to lead. Her mind knows it, as do her feet. For her, the world is a forest, fenceless and endless. I lived with a bunch of wonderful people a few miles from Malai Khan, in the Valley of Mandal River where it curves and broadens in its expanse, called Rathuadhab. Ramparts of an old walking bridge stand in the middle of this gentle river like a gateway to an ancient kingdom. 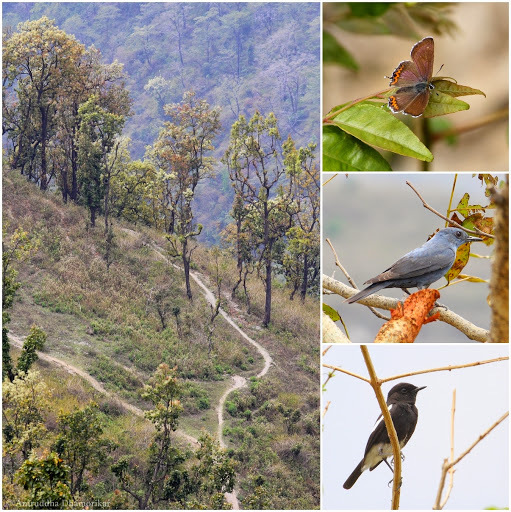 The valley is cloaked by Sal and Silver Oak, and White-crested Laughing Thrush, Plum-headed Parakeets, Red-billed Blue Magpies, and Asian Paradise Flycatchers, along with Himalayan Flameback and Greater Yellow-naped Woodpeckers and a variety of bulbuls call this forest home. Signs of elephants on the road and the valley are common here, as are Sambar, Barking Deer, and leopards. Life in the river is abundant, and the River Lapwings, Crested, Pied, White-throated and Small Blue Kingfishers reign over the waters. This area is a primary forest with minimal impact of humans. Except for a little bit of lopping and cutting, the only major human recognition here is the road. By the measure of the road, I would call it endless as it seemed to pass through the rich untouched forests far and wide. A visit to the Mundiapani Forest Rest house said otherwise. Class 1: This is when trophy hunting was a prime sport; and although tigers were the prized catch, species of deer and birds were also commonly hunted alongside. You will notice a sense of pride or satisfaction amongst the hunters, either for bagging a kill or for being more-or-less content with the number of animals shot. The last tiger of this hunting block was shot somewhere between 1935 and 45. Class 2: By early 1950s the tone changes into something more of disappointment and resentment. This sudden shift is evidently the result of relentless trophy hunting – one of the major causes of emptying forests by a rate unmatched by nature’s pace of regeneration. Class 3: I could not find the end of Class 2, so I jumped a few decades and found a complete shift in the attitudes of the people visiting this rest house. Was it because of the enactment of the Wildlife Protection Act, 1972, or a result of hopelessness in finding shikar? Perhaps it is both, since the Act came into force only when it was realised that India’s wildlife was being extirpated relentlessly. The shift from Class 1 to 3, spanning 80 years, were surprisingly distinct. Why was there such marked shift in people’s thinking, especially of Class 3? Was it because hunting was banned, and that forced people to take up binoculars and just relax with nature? Was it because they became so busy earning money in the cities that all they wanted to do here was relax, and not bother about hunting? – this is remarkably evident in the last two entries I mentioned above. Or was it because of an increased awareness amongst people – enlightenment about ethics and respect for wildlife, or was it simply a realization that forests and its wildlife are depleting? That it is not endless? Forests are viewed as deep and dark places where evil lurks. This view was especially strong during Colonial India, and thus hunting and taming of wilderness areas was justified. Corbett’s hunting tales could also be read on the same lines although he maintained a scientific approach towards finding out the reason of tigers and leopards becoming maneaters. Perhaps people were inspired to become hunters after him, and although he played a crucial role in advocating conservation in his later years, a league of wilderness tamers was born. Today, the Mundiapani forest has no tigers in it, although there is no reason why it hasn’t been repopulated again. Perhaps the scars of ruthless hunting are still fresh, or perhaps the tigers know that it is a lost ground. This is a vast country, and it is only in a handful few places in India that you will sense the endlessness of the forests. In the back of my mind, I always think of the cities, and wonder how I ended up there than here. We drove several hundred miles through Marchula and around Mohan, and followed Ramganga River to enter the Pauri Garhwal, and on from Palain River to Lansdowne, through some of the most ethereal Mix-deciduous Sal and Himalayan subtropical pine forests. 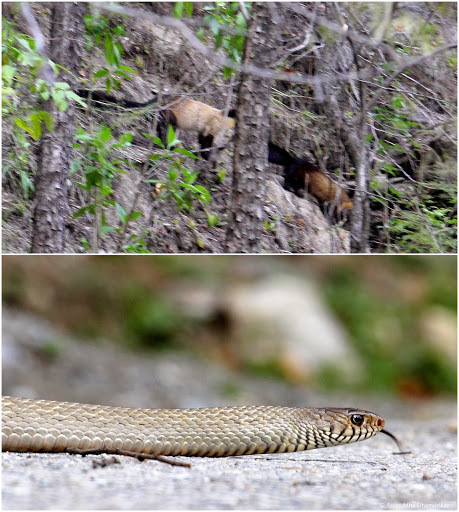 We were to witness a tussle between a pair of Yellow-throated Martens and an Indian Rat Snake that stood around a bend in the road, but they were disturbed by the sudden appearance of our vehicle and the martens went up the hill, and away from our sight. The snake, slowly relaxing, went in the exact opposite direction – downhill. 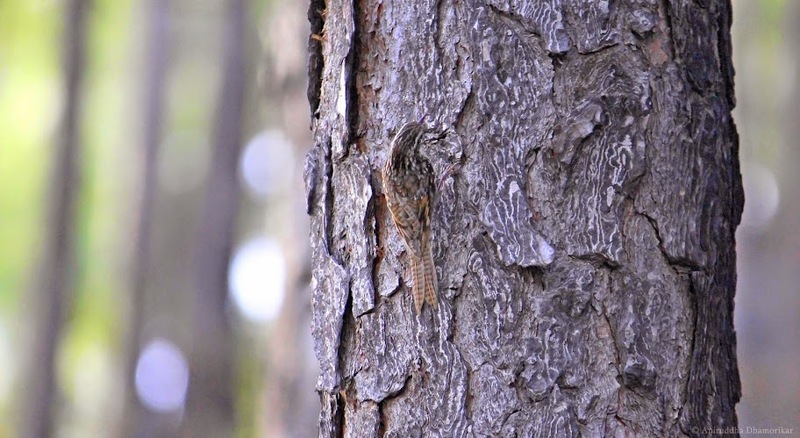 A pair of Himalayan Treecreeper was out hunting, climbing and abseiling with ease on the pine trunks. Every time I saw them they had a little morsel of an insect in their beaks. They are one of the few animals that live their entire life in these subtropical pines. The scent of the pines still lingers in my mind, and these fairy birds dancing in the evening glow of the light, and the cool thin air that gently touches your skin, and the echoless valleys fill me with awe. What spell this place has on me I know not. The innate will to be amongst these trees, where I know I wouldn’t last a few days, surges every time I’m here. This is not paradise, unless you decide to lock yourself up in a fancy resort in a quaint tourist town. Attacks of tigers and leopards, and of elephants and other herbivores raiding crops are, if infrequent, as common as they were during Corbett’s times. Landslides and men disappearing into the woods never to return happen here more than on television, and ancient trees sing here songs unsung, if only you were to listen. In this landscape I felt that forests in their entirety will never vanish, the mountains will protect them, and the rivers will guide them, but the vastness and endlessness associated with it will. We’re cornering wilderness without even an idea of what cornered wilderness can do. We only have a plain idea of what a cornered wolf or a tiger is capable of. We’re fencing wilderness without even a thought that we’re caging ourselves. And we live with an illusion that there is still enough for everyone – enough oxygen and water – the basics of a forest. We’ve created an illusion that our resources are endless. We suffer from what I call the Endless Forest Effect. Interestingly it is not affecting humanity significantly, but has already affected wildlife. I stood on the western Shore of Kosi River on the day I arrived in Corbett Tiger Reserve, and looked on in the dense forests that lie beyond. A large Indian Flapshell Turtle came to the surface of the water for air in a circle of Golden Mahseer swimming in the undercurrents. An endless line of resorts and cottages dotted the shoreline I stood on. A road cut through the forests a little inland, and further beyond the forests continued over the hills that would appear to a bystander as an illusionary endless forest. A century ago, this spot I stood on acted as a corridor for the wildlife, and especially elephants, to migrate eastwards in the lowlands of Terai Arc landscape. 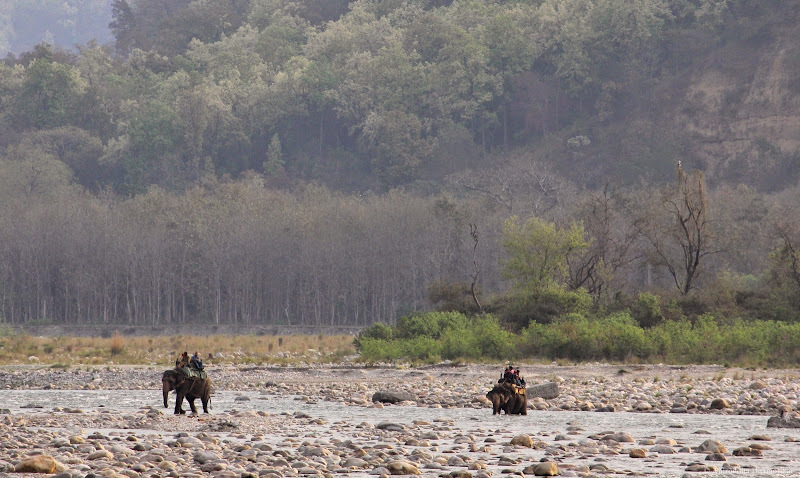 I imagined parades of elephants crossing the nimble flowing Kosi, drinking its waters as they passed on, and climbed the last of the Shivalik hills before reaching the plains. And as I gazed into the distance, I saw two tamed elephants carrying a load of tourists perched atop crossing these waters. Both of them took a pause in elephant-knee-deep waters to drink through it, and swayed left and right as they crossed over to the resort-side of the river. They were to stand by the roadside for another load of tourists to go piggybacking on their backs. I watched them standing here munching on sugarcane leaves, and I wondered if they remember their identity – did they remember the sojourns of their ancestors from the Himalaya to the lowlands? Have they seen their wild cousins do so? And I wondered if elephants consider these forests endless. Why haven't you written any posts on monsoon this year? I thought I would enjoy reading your posts while I wait for it to hit my hometown. Please write (mon)soon.